We won the 2015 APL Commended award for our ‘Hearn road’ project along with a Commended award for the water feature. We were also shortlisted for the same project in two other categories. The ‘Hearn road’ project in Strand on the Green, West london was a five week project creating a family garden. The garden was long and narrow, situated on a slope with three gentle terraces. The new layout consisted of a patio area, cladded stone retaining wall with an integrated water wall, new lawn, children’s den and climbing wall with storage cupboards on a raised hardwood deck. We also designed and installed a new planting and lighting scheme. 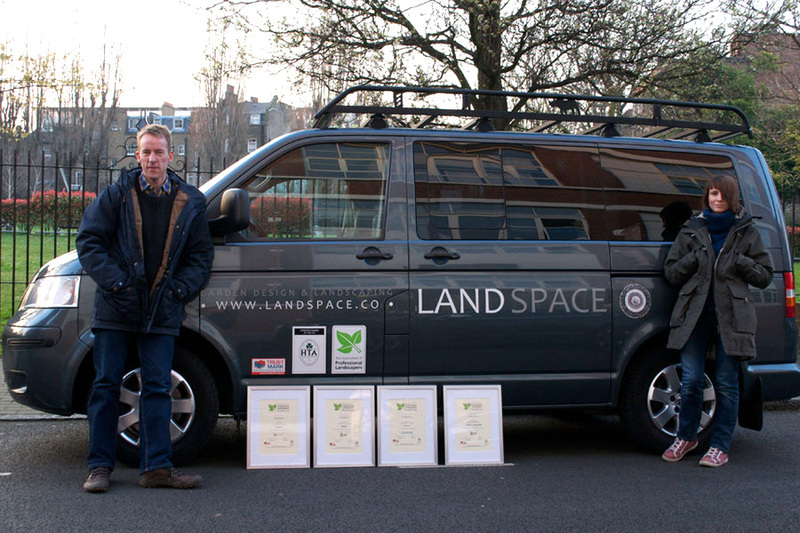 We won four awards – one for the Best Overall Garden for Design and Build, and the Overall Hard Landscaping Award. Also Best in category for Gardens budgeted between 25-50k and a Highly Commended Award in the same category. Three of the awards were for the Priory road project in Kew which took around six weeks to build – front and back. It was a challenging task with difficult access through the client’s house and working in a small, tight space. We had to carefully schedule every detail of the build to guarantee a seamless project that was delivered on time and to the highest possible finish and attention to detail. The clients were delighted with the finished gardens as were we to receive the awards. We also received a Highly commended Award for the Wakefield street project. This was a six week project consisting of redesigning and building the roof terrace and basement lightwell areas of a newly built Bloomsbury town house. A very challenging project with very awkward access via scaffolding and towers. The team worked tirelessly through a very hot July and delivered the project on time. The clients were very happy with the finished spaces and acknowledged the huge transformation to the spaces. We won the APL 2011 Highly Commended Award for ‘Commercial Garden’ category for Haberdashers’ Aske’s Hatcham College project design and build. A nine week project completed on two campuses at Jerningham Road and Pepys Road in New Cross, London SE14. We were very happy to win a Royal Horticultural Society Silver-Gilt Medal at the 2009 London Plant & Design Show’s ‘Front Garden’ Award for our work in collaboration with fellow Capel Manor graduates.